We offer great prices and services in Southwest Calgary. We offer full service dog grooming. 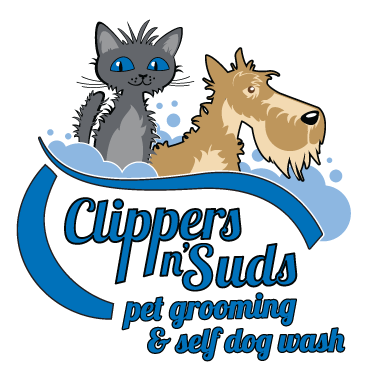 This includes an initial consultation with our professional groomers, and a brush out and pre-bath trim with all natural and specialized shampoos according to your pet’s needs. All the pets are housed in a safe cage free environment. We ask that you pick up your dog within an hour of us calling you when they have finished being groomed – this will be approximately 3 hours. Additional charges may apply if your dog is not picked up within a reasonable time frame. This will not be done if it is clearly uncomfortable to your dog on large areas of the body or in sensitive areas like the armpits or groin. 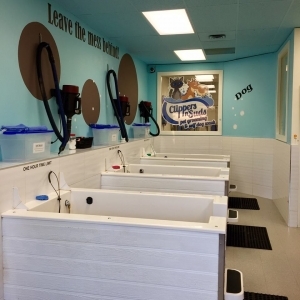 Our goal is to provide a comfortable grooming experience so that your dog doesn’t run in terror from a groomer in 6-8 weeks. We offer free advice on how to properly maintain a healthy coat between groomings so please feel free to ask us. We will never lecture you on your matted dog. We prefer prevention and education. Our amazing self service dog wash is like no other. 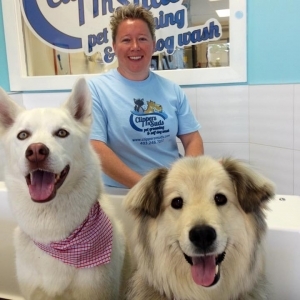 Custom-built wash stations can accommodate any size of dog. Plus, all the products and tools are there and ready for you to use – and the best part – YOU LEAVE THE MESS HERE! WE ACCEPT DEBIT OR CASH ONLY PLEASE !!! NOTE: WE DO NOT TAKE RESPONSIBILITY FOR ANY DOG INFECTED WITH LICE AND/OR FLEAS. I was really nervous about getting my fearful rescue dog Nakiska groomed. She had never been bathed or groomed before and her nervous reaction to new people and dogs made me really apprehensive. My worries vanished when I arrived at Clippers N Suds and met Laurel and Tanis. They have a way with dogs and their professionalism put my mind at ease. If I knew how smoothly everything would go, I would have brought her in way before. She looks so good after getting groomed that I look forward to bringing her back for regular maintenance. Although we can have a temperamental cat, both Laural & Tanis were able to get out all of Mavis’ mats out of his coat, give him a proper grooming and were so kind and helpful. I will definitely be going back and recommending their business! Thank you ladies! What an absolutely fantastic place! It is a very clean, professional place. Tannis and Laural are so nice and helpful. Tannis did a great job trimming my dogs nails and was very knowledgable in the best way for me to wash and dry my dogs. Honestly, my dogs have never looked better! 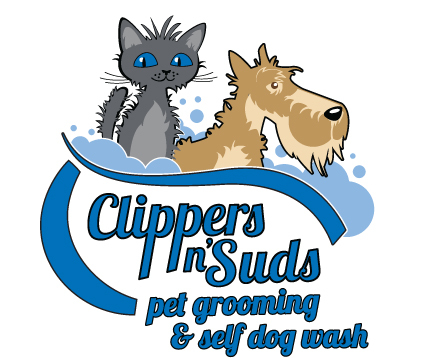 They were not stressed or anxious and I would absolutely recommend Clippers and Suds to anyone. This is my go to for all my dog grooming needs from here on. Thanks again Tannis! Thank you to the Gold-Star staff at Clippers ‘n Suds. Tanis and her crew go above and beyond to make my dogs Charlie and Bella at ease… and looking great! Bella is a handful with the hose and dryer and I appreciate the extra love that Tanis and Nicole gave her today.